For the people of Boven Digoel, the existence and illumination of PJU-TS itself provides a sense of security, especially when they are doing night activities. "With this lamp, it has secured this road, if there are no lights, we feel insecure "said Lucas Aurop, one of the residents of Boven Digoel. A similar thing was expressed by Martinus Siawok, one of the Asmat residents. "I, in the name of the Asmat community, would like to thank you for the public lighting assistance programmed from the center, we feel that so far it has been very dark that we only reach PLN, but now there is road lighting assistance that is very helpful for us," he added. Director of Electricity Business Development, Hendra Iswahyudi, who was present on behalf of the Minister of Energy and Mineral Resources at the Inauguration of PJU-TS in Papua Province, Thursday (4/4) revealed that the installation of PJU-TS at 250 points in Asmat Regency would be able to reduce regional expenditure by saving electricity bill, approximately Rp. 4,850,000 per month which is equivalent to saving 3,300 kWh per month. "One PJU-TS has an electrical power of 40 watts with a distance between PJUs of 20 meters. Meanwhile the installation at 50 points will save electricity from the local government of Boven Digoel to approximately Rp. 970,000 per month, equivalent to saving 660 kWh per month, as many as 37 PJU-TS were installed on the market and terminal roads, 11 points on the road to the port, and 2 points in front of the student dormitory, "he said. 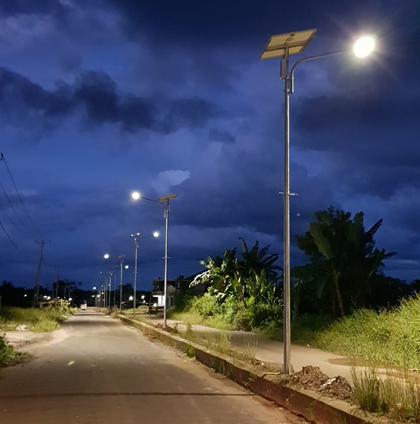 Hendra explained that PJU-TS is a street lighting that uses sunlight as a source of electrical energy, so it becomes a solution to be used on roads in areas that have not been reached by PLN electricity or in areas that have been electrified by PLN, but want to reduce electricity consumption the area. The installation of PJU-TS in Boven Digoel and Asmat Regencies is part of the 2018 PJU-TS Program implemented in 26 Provinces with a total of 21,837 points and Papua Province obtains 600 PJU-TS installations. Hendra also said that the inauguration of PJU-TS in Boven Digoel was the Government's effort to ensure that the infrastructure was properly installed and could be utilized by the community. "The inauguration this time constitutes 50% of the allocation of PJU-TS installed in Papua Province with a budget of 2018, which is as many as 600 points. We want to ensure the existing budget returns directly to the community through the construction of the infrastructure," he said. Through the installation of PJU-TS, it is also expected to be able to provide benefits and help communities in Papua Province, especially Boven Digoel and Asmat Regencies so that economic development can run faster. "I also hope that the infrastructures that has been and will be built, can be managed and maintained by the Regional Government and the community, so that the benefits can be felt by the community for a long time," concluded Hendra. On the same occasion, the Regent of Boven Digoel, Diktus Tambonob, said that his area was still short of electricity even though it already had a diesel engine and the productivity of the community was disrupted because of frequent blackouts. "Our area is a place so far from the sea. When we want to get electrical energy to turn on tools such as freezers to store marine fish, the electricity is very large. If all the electrical energy needs are taken from the machine, including street lighting, of course will make the engine load increase, "he said.